Hi All, I can't see a thread dedicated to these new novels so this can go here. Published on 11 April - there is a new excerpt from the upcoming 'Last Shot' novel by Daniel Jose Older. "We have docking clearance" - rofl! here it is if you are interested..
whooo lots here about papa Han! "StarWars.com: One of the themes you get to explore in the present day sections is Han being settled and now he’s a father. How does fatherhood and married life play into his character when, as you mentioned earlier, he is at a crossroads? Daniel José Older: He struggles with it in the way that any person would, especially since he’s used to the run-around, being able to bop from place to place freely, and suddenly being tied down and what does that mean. But also craving it, being really content, but not knowing what to do with that contentment. Even when Han was in smuggling, and after that in the Rebellion, that was a whole free running lifestyle, even if it was being on the run and difficult at times, and now they’ve won the war. It’s like that line from Hamilton, “Winning was easy, governing’s harder.” That’s what the whole New Republic is dealing with — that question of how do you keep the whole galaxy together now after a devastating galactic civil war. What does this look like? They fail in some ways and succeed in others. And that’s what Han is going through. He feels like a total failure and I think that’s what he is struggling with in this book, like nothing he is doing is working. But I think that’s what success also feels like, because you’re trying these things and some of them work and some of them don’t, but you are magnifying your own mistakes and they seem giant. Of course, we also have the shadow of what happens later, with Ben and him, looming over every decision he makes as a father. So there’s that added tension, but that was a tension I figured to let best work its own magic and just stay there in the shadows. No direct mention of any of that. StarWars.com: Just being a new parent is a hard enough game for Han Solo to sort out because that’s a realm he has no real experience in. Daniel José Older: Exactly. Exactly. And again, it’s a question of responsibility. It’s a very different challenge to take on responsibility of being a rebel leader and part of a huge movement, but there’s a whole other level to it when you’re a father and you’re responsible for one single life that matters to you on an entirely different level. And just the basic annoyances I really wanted to capture, particularly in the first scenes — just stepping on toys when you get up at four o’clock in the morning because you get a call and you’re trying not to wake up the kid and you want your coffee but the droid is making too much noise. 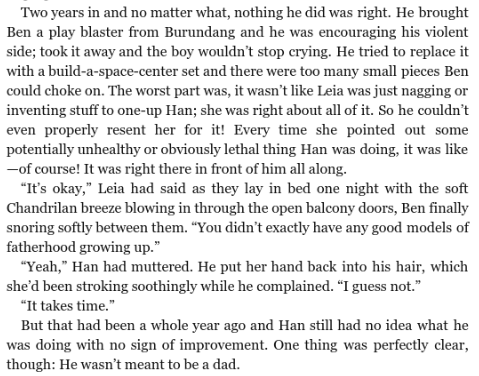 All these really basic little things that humanize the experience of Han being a father." I have to wait till Thursday for stupid Amazon EU to deliver my digital copy- so I won't read any huge spoilers. I think this book deserves a thread of its own. A few more snippets involving Ben that I've found around. On another note: Ben really doesn't like that droid, seemingly before that whole disturbing incident, which doesn't make things better. Ben cries a lot in passages I've seen of this book and he seems really easily spooked. I think most of us guessed that he was always an extra sensitive child! This poor child. If he doesn't get his redemption and happily ever after with Rey, I will be devastated. Well, after having read these book spoilers, I’m 100% sure he will be redeemed. For some reason, I find it really interesting how they insinuated what little Ben did to that droid and how they described it. It's basically a fancy mind trick, but baby Ben essentially took away the "corruption" in that droid, which was depicted with the words "bright light pouring in everywhere." And the droid got to start anew. It's some extremely evocative religious imagery, IMO. Did he use the Force or something else created the flash? Yeah, that's how read it, which is why I interpreted that moment in a very religious manner. Almost like he wiped that droid clean of "sin" by doing that. It's just more evidence of a whole "chosen one" set-up. Damn. I saw that this morning on Tumblr and it was really hard to read. It's affecting my day That book hits my mailbox tonight... Need context! I've been reading the Legends of Luke and there are some interesting passages in there. I can't find the discussion on it. Did we not have one? Other people said that Han and Lando shut it down with something they did. But it definitely seems like Ben did something with the Force. I don't know. I've seen people pointing out that the droid considering killing little Ben is a parallel to Luke, complete with coming to their senses and putting the would-be deadly blade weapon away. Yikes. 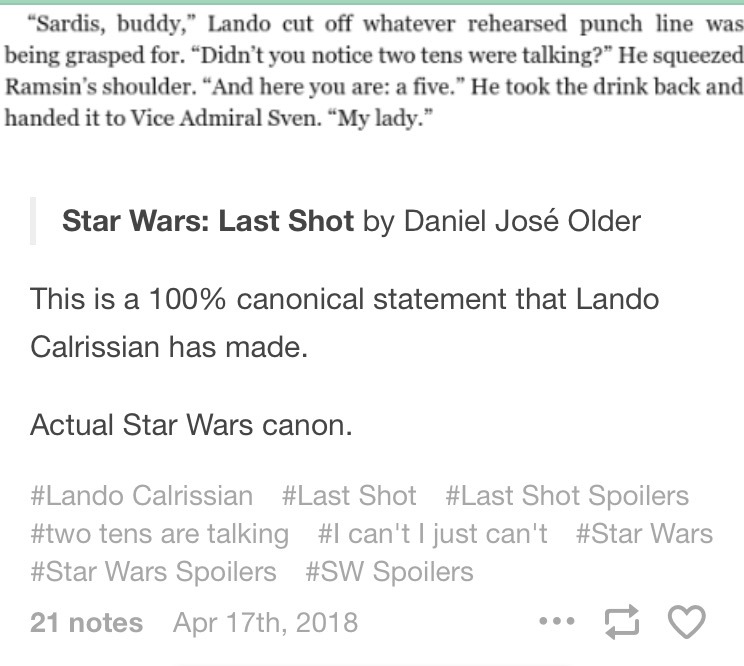 A separate thread for Last Shot has been made by taking the posts from the canon novels General Discussion thread. I started reading this morning. I kinda love how in the first non-prologue chapter, Han gets told to "put a shirt on" twice. @ISeeAnIsland wrote: I started reading this morning. I kinda love how in the first non-prologue chapter, Han gets told to "put a shirt on" twice. It's in the family. Confirmed. Ladies and gentlemen, the future Supreme Leader of the galaxy. Also: Han thinks Ben playing with a toy blaster is dangerous, but they have a power drill lying around the house? It bugs me but isn't surprising that Ben seems to be left with a droid quite a lot. And he really does cry at the drop of a hat, poor kid. Reading all the Ben parts really does confirm how absent Han and especially Leia at this point were.It's clear they love him a lot and he's very attached to them but he's left with droids way too much.And Han is so insecure about being fit to be a father,it's really sad.And that's just when Ben was a kid and it was relatively easy compared to how I imagine would have been when Snoke really started influencing Ben and his force sensitivity got stronger and harder to deal with. I can’t wait until I have some time to read this book! It looks like Han had doubts about his ability to be a father, but he wanted to do his best. Poor little Ben looks like he was very sensitive child and having a droid try to kill you must have been quite dramatic even if he was very young. I think it’s adorable that Ben seems to adore Unca Wanwo. Based on the excerpts so far, C3PO doesn’t seem to be one of the household droids helping care for Ben. I thought C3PO would have stayed with Leia during that time, for sure. Also, the book makes it clear Han and Leia loved Ben, but they were still devoted to the cause of the New Republic. I’m sure he grew up feeling that he had to share them with their cause. @Kessel wrote: I can’t wait until I have some time to read this book! I think Adam Driver actually commented on that at some point; he said it's part of why Kylo Ren hates the Resistance. I may be misremembering, but it could have been mentioned in that EW feature that came out in November 2017.